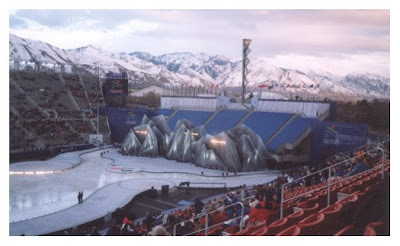 I stumbled upon this picture I took back when the Olympics came to Utah in 2002. This is the Olympic Stadium (aka University of Utah Rice Eccles Stadium). I spent a LOT of time on that campus as I was a student there for a few years. My hubby and I were attending the Para-Olympic's closing ceremonies when I snapped this image. Interesting side note: It hadn't snowed for weeks before those Olympics. Then the night before the Opening ceremonies Salt Lake City got a really nice snow storm that set the mood for the entire Olympics. What a beautiful picture, Kelly! Looks a little too chilly for me... reminds me of Candlestick Park in June. Br-r-r-r-r-r! what ARE those blobby looking things in front of the seats to the far right? i'm not an olympic's watcher. Yep, those were fake mountains. It was all part of the artsy, part of the opening and closing ceremonies. Reminds me of the mascots they chose for those Olympics. I just groaned. In the attempt to avoid 'offending' anyone they made these nondescript something or others. Sheesh! All in all though, it was a good experience to have the Olympics here in my area of the planet. Sometimes it is pretty..come August everything will be brown again.